I wanted to push on to St Neots today, and thus be in with a chance of making it home for choir practice on Thursday, but my body had other ideas. Specifically, my right calf, which cramped the minute I got up and had me hobbling and cursing with pain till late morning. 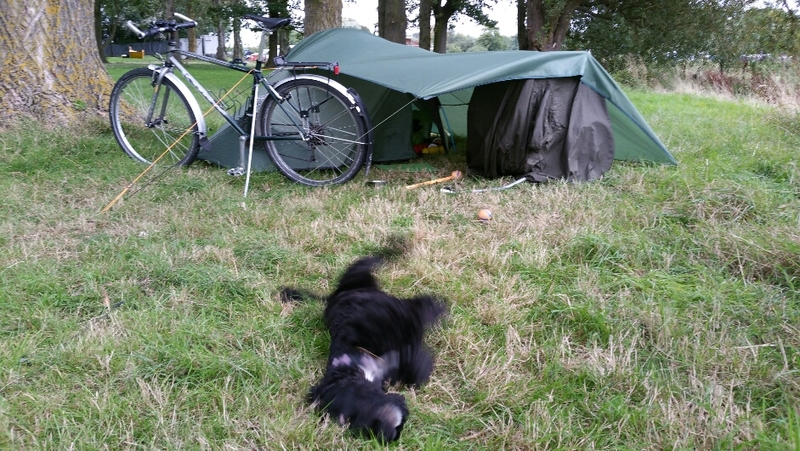 We had run out of water in Northampton yesterday, still with a few miles to ride and I got dehydrated I think. Schoolboy error; stupid. So I paid up for another night at the marina here in Earls Barton and we wandered into the village via Nene Way, along the river. There are a couple of guillotine locks here. 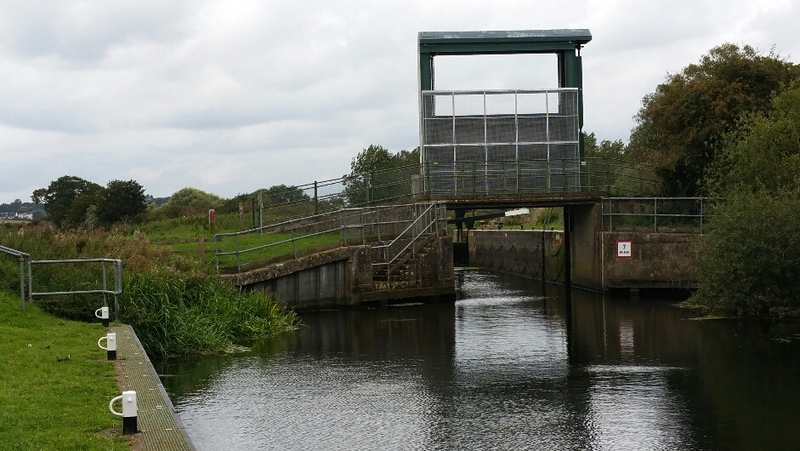 Locks terrify me anyway, and these look double scarey, although I expect they are designed so it’s quite difficult to behead your boat. 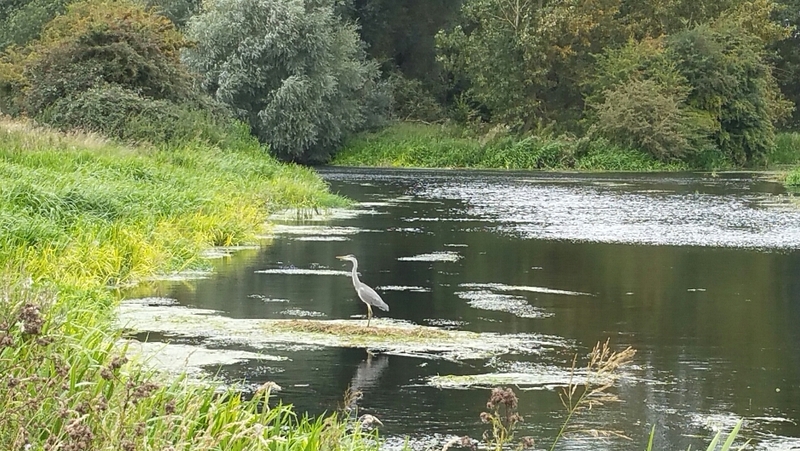 The river is pretty, with fish darting around in the clear water and heron out to catch them. Heading away from the Nene and towards the village, we could see a roofscape of round pointy tent tops and heraldic pennants flying. 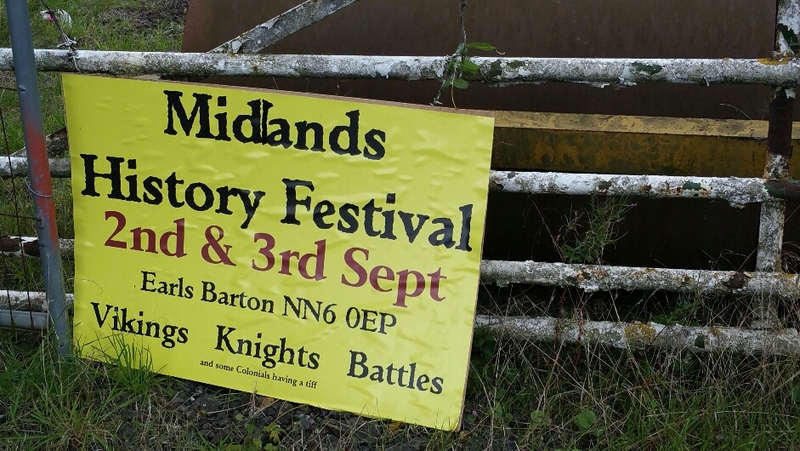 Upon reaching the place, a sign said it was Midlands History Festival, involving knights and vikings, and in small writing, something about ‘Colonials having a bit of a tiff’. Had it said tiffin, we would have gone in. The village has a few fair shops, none of which were open, this being Sunday, apart from a big Co-op and a more down-market convenience store. The latter looked a safer bet for leaving Raisin outside, so I dashed in and bought tasteless bread and unripe tomatoes. The thing I most need at the moment, however, is meths for my stove. I thought I would ask if they sold it, just in case. The chap serving said he hadn’t heard of it. “Methylated spirits?” I then said, to clarify. He shook his head. He seemed to be under the impression it was a brand of drink – indeed it probably tastes better than some of the cheaper stuff they had on sale in the booze section. There’s only us here, and a caravan, in a large area under some big old trees that I think are black poplar – new to me and quite rare. The caravan lady stopped by for a chat and explained that she and her husband live in Gran Canaria but come back in the summer to do a bit of work in their business. There’s no electricity ‘hook up’ on site yet for caravans, so she said they were ‘slumming it’ without a hair drier or hoover and suchlike during their stay. I wanted to laugh but feared it would sound hysterical, so just nodded in sympathy. It’s difficult to know but I reckon I have enough meths for 3 or 4 more water boils, which means rationing it unless I can find an ironmongers very soon. I shall have to decide which is more palatable: cold coffee or uncooked Supernoodles. During the afternoon it turned windy and threatened rain and, there being plenty of time to kill, I made a basha (if that is the correct expression). 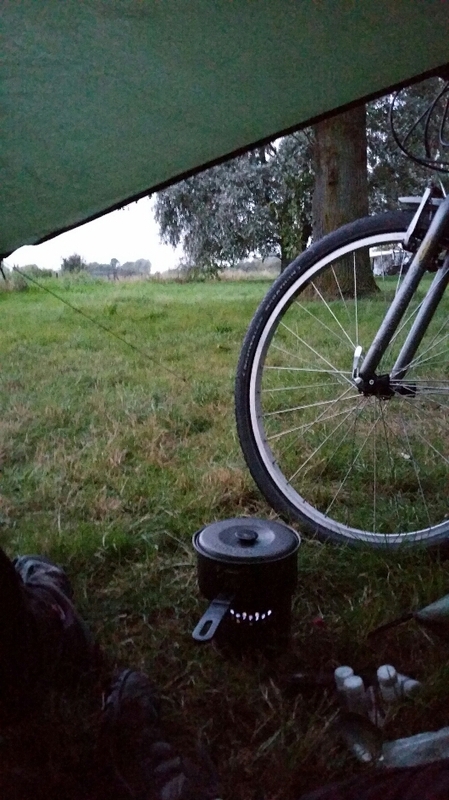 This evening, in the rain, I cooked slightly crunchy Supernoodles without getting wet or setting fire to the tent. If nothing gets blown away or broken in the night then I can say it was a success. Weather and legs permitting we will be off tomorrow, heading east again, for Cambridgeshire, and then we’ll be across the flat lands and home in no time.